Investment in Design vessel series entrusted to a Portuguese shipbuilder. Wartsila Flexible Manufacturing Sys- tem, the production model which has evolved out of the company's 'focused factory' concept. The Italian plant creat- ed something of the template for the new system, whereby nominated back- up factories support each product-spe- cific factory for engine assembly and component manufacture. Its role in meeting the surging demand for Wart- sila 46 medium-speed engines, for which the Turku plant in Finland is the lead producer, is illustrative of the arrangements. ZA40S four-stroke series is clearly in evidence at Trieste, where it contributes substantially to the delivery program through to 2004. The Italian works is also the nominated factory for the Wart- sila 26X, aimed at high-speed trans- portation and naval applications, and for the mighty 64-type four-stroke, the world's most powerful medium-speed diesel, delivering a staggering 2 MW per cylinder. Commencing with the 13,645-dwt German vessel Container- ships VI, commissioned in 1999, a total 11 engines of the Wartsila 64 type have now been supplied for marine propul- sion. At press time, the Finnish engine group was hoping that the design would be nominated for an Italian tanker new- build project, to set a major new phase of diesel production in train at Trieste. UK, also expresses the market's recep- tivity to a further option and additional player. Two Dolphin propulsors have been ordered for Radisson Seven Seas' 48,000-gt diesel-electric cruise liner under construction at Mariotti's premis- es in Genoa harbor. Crane-Lips' Dutch-honed skills in pro- pellers, thrusters and hydrodynamics has resulted in a pod line covering units powers between 3-MW and more than 19-MW. The prestigious, milestone cruise ship application calls for a pair of outboard, podded drives delivering 7,000-kW apiece at 170 rpm. Applications Can Save You Money! 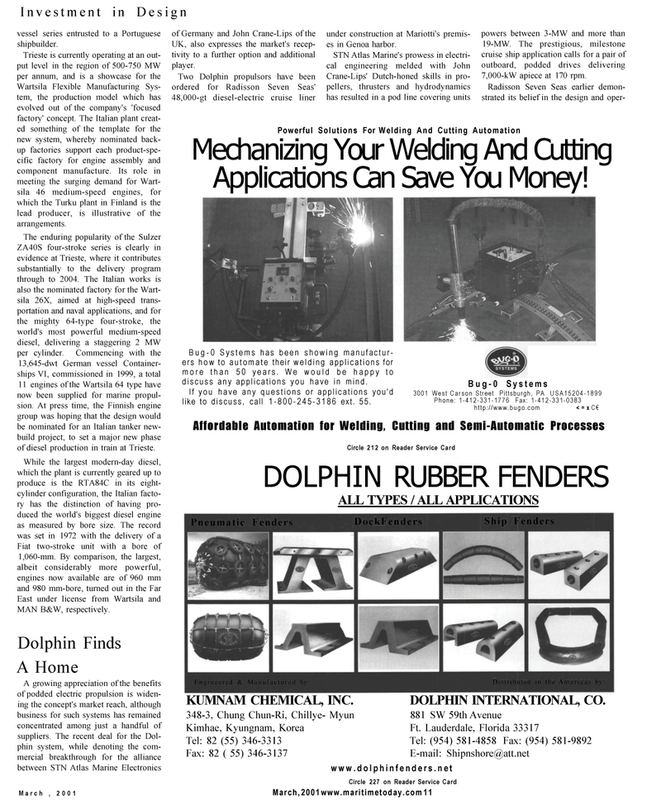 Bug-0 Systems has been showing manufactur- ers how to automate their welding applications for more than 50 years. We would be happy to discuss any applications you have in mind. If you have any questions or applications you'd like to discuss, call 1-800-245-3186 ext. 55.